IFA 2016: SAMSUNG announces Gear S3 classic and Gear S3 frontier smartwatches. Samsung Electronics today announced the Gear S3 smartwatch at IFA, Berlin. The Gear S3 combines timeless design with the latest in mobile technology, including IP68 water resistance, mobile payments, LTE connectivity, and built-in speaker and GPS, making it the ideal addition to any watch collection. Samsung Gear S3 is available in two bold designs to suit different user's lifestyles: frontier and classic. Inspired by the active explorer, the Gear S3 frontier evokes a rugged outdoor look with an enduring style that blends form and function. The frontier was designed to perform in any setting or environment - whether business or leisure. The Gear S3 classic pays homage to the minimalist, elegant style found in the most iconic timepieces. The classic was designed with meticulous attention to detail - with its size and shape chosen to attain the same consistency and balance of a well-crafted luxury watch. The Gear S3 was created based on intensive research and surveys from consumers, industry leaders and watch experts all around the world. Every feature, from the circular bezel to the premium finishing and buckles, has been reimagined to elicit the look of a classic timepiece. In addition, the Gear S3 is compatible with 22mm watch bands so consumers can easily personalize their watch to match any outfit or special occasion. In addition to its sleek look, the Gear S3 meets IP68 standards for water resistance and offers military-level durability so consumers can get through their day, regardless of weather conditions. For the first time on the Gear series, the Gear S3 features Corning Gorilla Glass SR+, which is specifically designed for wearable devices to provide a tougher, more scratch resistant and crisp display. The Gear S3's signature rotating bezel has been enhanced with new features. Without touching the screen, users can accept or reject a call or snooze an alarm. In addition, by writing on the display, messages will automatically convert to texts. Users can also create short reminders and to-do lists to manage even the most hectic schedules with the Reminders application. The Gear S3 puts convenience at the flick of the wrist, allowing users to leave their smartphone behind when they don't need it on-hand. The built-in GPS functionality enables users to accurately monitor their daily fitness activities while the Alti/barometer and Speedometer allow users to track everything from altitude and atmospheric pressure to sudden changes in weather, distance traveled and speed. Never miss another phone call with LTE connection making its Samsung smartwatch debut on the Gear S3 frontier. Additionally, with the built-in speaker, users can activate voice messaging and listen to their favorite tunes. With a battery that lasts up to four days on a single charge, users can enjoy their music, make calls and show off their stylish smartwatch longer. 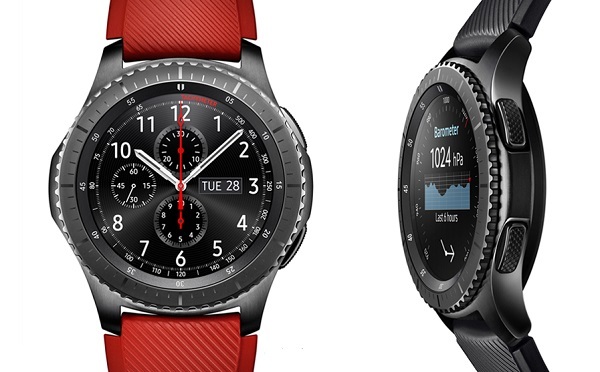 Now Gear S3 users in select markets can use their smartwatch to make a purchase almost anywhere they can swipe or tap a card with Samsung Pay for Gear S3. Samsung Pay, with Magnetic Secure Transmission (MST) and Near Field Communication (NFC) support, means users can easily register a credit or debit card and use it to make mobile payments. Samsung Pay slims down user's wallets and makes payments accessible on their wrist. The Gear S3 was designed with consumer's safety in mind. In case of an emergency, users can activate the SOS and location tracking capabilities to alert family, friends and emergency professionals about crisis situations, even when their phone isn't in-hand. Consumers can access a diverse range of apps, including fitness, music, news, sports and travel apps - all optimized for the Gear lineup of devices including the Gear S2 and the Gear S3. With a variety of customizable watch faces available for download, users can personalize the circular UI to fit their lifestyle. Select apps and watch faces will be available for download directly from the Gear S3 without the need to first download on a smartphone. Adding to the Tizen ecosystem, Samsung introduces the integration of BMW's personal mobility companion with the new Gear S3 - helping users stay on time, in touch and in control while further enhancing the connected automobile experience. With the BMW Connected app, users can get alerts when it's time to leave for their next trip, check their fuel level, unlock their BMW and more - all directly from the Gear S3 watch face.